People often confuse homeopathy with natural medicine or herbal medicine. For instance, sometimes I hear people refer to homeopathy when in reality they mean naturopathy or even herbal medicine. Plants and herbs have long been used as medicine. Various traditional medical systems dating back thousands of years have adapted herbs for healing purposes, including Ayurvedic medicine and traditional Chinese medicine (TCM). African and Native American cultures have also used herbs in their healing rituals. At the same time, homeopathy uses herbs as well to make its remedies. However, homeopathy will highly dilute the healing herbs, so none of the original substance remains once the homeopathic remedy has been created. Homeopathic remedies are also available in pellets and liquids, whereas herbal remedies are found in more forms, including extracts, ointments, lotions, infusions, powders, essential oils, tinctures, syrups, and teas. Homeopathy often follows the principle that “like cures like.” It is where certain substances that have harmful effects can treat various conditions when highly diluted and made into a homeopathic remedy. On the other hand, sometimes homeopathy and herbal medicine have somewhat of an overlap. For example, both black cohosh and its homeopathic form, cimicifuga, are often used for women’s health issues, including menopause, menstrual problems, depression, and pregnancy. Although there are often similarities between health benefits, there are major differences, too. Herbal remedies should be taken daily, whereas homeopathic remedies will be prescribed several times per day or once or twice per week or month, depending on the remedy and condition it is being used to treat. There are no side effects associated with homeopathy, but some herbal remedies may have some precautions or may interact with certain drugs. Interactions between medications and homeopathic remedies are also very rare. The following article will examine homeopathic remedies made from herbal remedies. As you will learn, many of the homeopathic and herbal remedies benefit similar conditions. However, homeopathic remedies will treat different conditions other than what the herbal remedy had originally intended. Let’s take a look at 10 of the most common healing herbs made into homeopathic remedies, and what benefits you get from them. Black cohosh is native to North America and has been used as a folk remedy for centuries in the treatment of pain, malaria, anxiety, inflammation, and various other disorders. In the mid-20th century, it also became a common treatment for women’s health issues. Black cohosh has also served as an anti-inflammatory and painkiller in traditional Chinese medicine. In homeopathy, it is prescribed mostly for gynecological disorders and depression, as well as head, neck, and back pain. In traditional Indian medicine, aloe is used for skin diseases, constipation, abdominal pain, and worm infestation. In traditional Chinese medicine, aloe, or lu hui, is recommended for various fungal diseases. In the world of homeopathy, aloe is mainly used for digestive complaints, including diarrhea and hemorrhoids. Psychological traits attributed with homeopathic aloe include a reluctance to work, irritability, and dissatisfaction and anger. Homeopathic aloe is also used for headaches and hepatitis. Barberry is a berberine-containing herb that has been used for medicinal purposes for more than 2,500 years. It is a heart-healthy herb that can treat diarrhea, prevent and treat diabetes, combat metabolic syndrome, and cleanse the liver and gallbladder. As a homeopathic remedy, berberis has a strong affinity for treating urinary and digestive problems. It is also used for kidney disorders, cystitis, and gallbladder problems, as well as joint pain and lower back pain. Chamomile has been used for around 5,000 years to promote longevity and a youthful appearance. It is also used for anxiety, depression, arthritis, and gastrointestinal disorders. It is also recommended externally for treating skin problems like burns or eczema. Homeopathic Chamomilla works best for people exhibiting an extremely low pain threshold. They are also hypersensitive, while they also have a bad temper and hate being touched. The remedy is often given for stomach pain with diarrhea, toothaches, fever, irritability, and menstrual and labor pain. 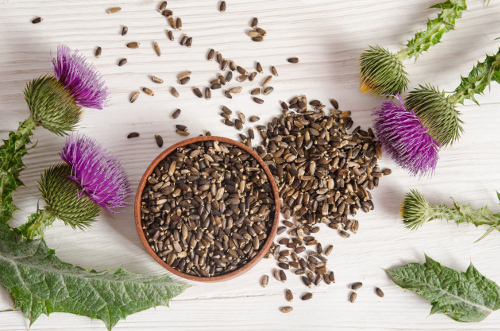 Milk thistle is native to the Mediterranean, and it is common for liver conditions. It also protects against cancer, lowers high cholesterol, controls and prevents diabetes, prevents gallstones, and promotes skin health. Homeopathic Carduus marianus is also used for liver issues, as well as gallbladder conditions and lung diseases. The person’s tongue will have a white center with red and indented edges. Beer, eating, motion, and touch all worsen the conditions. Other symptoms include varicose veins, hemorrhoids, constipation, and being easily angered. For over 4,700 years, the Chinese and Indians have used ginger tonics to treat health conditions. The therapeutic benefits of ginger root are thought to come from gingerols, and as a result, some of the top proven health benefits include nausea and indigestion, stroke and heart disease, malabsorption problems, compromised immunity, bacterial and fungal infections, ulcers, cancer, pain, and diabetes. In homeopathy, zingiber benefits the cheerful person, even when they are in pain. The remedy is mostly used for digestive disorders and symptoms like nausea, vomiting, and abdominal pain. Traditional Chinese doctors use mugwort in a treatment called moxibustion, where the dried plant is burned on the skin to help facilitate healing. The herb is used for soothing and treating joint pain, reversing breech birth position, and treating depression, malaria, and cancer. The classic symptom-picture of homeopathic Artemisia is nervous disorders, possibly triggered from grief, bad news, or a blow to the head. As a result, the remedy is used for seizures, sleepwalking, epilepsy, and chorea. In traditional Chinese medicine, wild yam is also called shan yao, and it helps digestion, immunity, reducing blood sugar, and much more. As a traditional Aztec remedy, wild yam was even used to treat abdominal pain and menstrual pain in Central America. It was also used to help produce the first birth control pill. From a homeopathic perspective, Dioscorea is used for people prone to stress, nervousness, and irritability. It is typically prescribed for renal colic linked with kidney stones, and a sharp pain that radiates down the legs and testicles. Eyebright has been used to treat eye strain and eye inflammation since the Middle Ages. Modern herbalists use it for infections and allergic conditions of the middle ear, eyes, sinuses, and nasal passages. People that respond well to the homeopathic version, Euphrasia, are typically melancholic and prone to daydreaming. Euphrasia also has a classic affinity with the eyes, and it is used for eye irritation with brining, cutting, and pressing pains, as well as sticky mucus. The remedy is also used for allergies, colds, hay fever, styes, and conjunctivitis. Valerian was once known as “all heal,” and it is common for treating insomnia, anxiety, stress, hypertension, and menstrual cramps. Homeopathic Valeriana, on the other hand, is used for people with an unstable state. Common symptoms include restlessness, nervousness, and irritability. Other symptoms include limb pains, flatulence, swearing, spasms, twitches, hysteria, and faintness. Valeriana is also used for headaches, a rapid pulse, and neuralgic pains. Have you ventured into natural and herbal medicines, and are curious as to how homeopathy can also help? I suggest finding a qualified homeopath. In an initial comprehensive interview, your homeopath retrieves emotional, mental, and physical symptoms that help determine what remedy is the best fit for you. All this information is important since homeopathy is an energetic form of medicine that works with energy, and moves it from or to areas of deficiency or excess in the body. Herbal remedies, on the other hand, is a natural, biological therapy that corrects certain imbalances of physiology in the body, while targeting specific organs, tissues, and cells, stimulating them for repair, detoxification, and optimal function. Axe, J., “Barberry: The Heart-Healthy Herb that Cleanses Your Gut, Liver & Gallbladder,” Dr. Axe; https://draxe.com/barberry/, last accessed June 30, 2017. Axe, J., “Relieve Menopause Symptoms & More with Black Cohosh,” Dr. Axe; https://draxe.com/black-cohosh/, last accessed June 30, 2017. Axe, J., “Aloe Vera Benefits: Heal Skin, Constipation & Immune System,” Dr. Axe; https://draxe.com/aloe-vera-benefits/, last accessed June 30, 2017. Axe, J., “Chamomile Benefits: Antioxidant, Anti-Inflammatory and Anti-Cancer,” Dr. Axe; https://draxe.com/chamomile-benefits/, last accessed June 30, 2017. Axe, J., “Milk Thistle Benefits: Detox the Liver & Boost Glutathione,” Dr. Axe; https://draxe.com/milk-thistle-benefits/, last accessed June 30, 2017. Axe, J., “10 Medicinal Ginger Health Benefits,” Dr. Axe; https://draxe.com/10-medicinal-ginger-health-benefits/, last accessed June 30, 2017. Axe, J., “Mugwort: the Herb that Fights Joint Pain, Depression & Cancer?” Dr. Axe; https://draxe.com/mugwort/, last accessed June 30, 2017. Axe, J., “Valerian Root Solves Insomnia, Anxiety & Even Blood Pressure,” Dr. Axe; https://draxe.com/valerian-root/, last accessed June 30, 2017. Vanta, B., “Homeopathic vs. Herbal,” LIVESTRONG, December 11, 2015; http://www.livestrong.com/article/317130-homeopathic-vs-herbal/.